The key fundamental economic events that can strongly influence the forex market this week feature the U.S. Non-Farm Payrolls data (51K) due out on Friday and the RBA, BOE, ECB and BOJ rate decisions scheduled for this week. Additional key economic releases due out this week are detailed further below, with the current market consensus expectations or the last result included in parenthesis whenever available. Monday’s economic data features the results of the Japanese Tankan Manufacturing Index (2), Swiss Retail Sales (4.5%), UK Manufacturing PMI (48.9), U.S. ISM Manufacturing PMI (50.5), and New Zealand’s NZIER Business Confidence (last 27). Tuesday’s key data includes Aussie Building Approvals (1.1%), Trade Balance (2.14B) and RBA Rate Decision (4.75%), plus UK Halifax HPI (Oct 4th-7th, last -1.2%), UK Construction PMI (51.7), plus a speech by ECB President Trichet and testimony by Fed Chairman Bernanke. On Wednesday, the market will closely monitor Aussie Retail Sales (0.3%), the UK Current Account (-10.4B) and Services PMI (50.7), plus the key U.S. numbers that include ADP Non-Farm Employment Change (76K) and ISM Non-Manufacturing PMI (53.1). Thursday will see the release of the BOE’s Rate Decision (0.5%) and Asset Purchase Facility (200B), the ECB’s Rate Decision (1.50%) and Press Conference, Canadian Building Permits (0.6%) and Ivey PMI (58.2), plus U.S. Weekly Initial Jobless Claims (411K) and Pending Home Sales (-1.6). Friday’s schedule features this week’s highlighted U.S. Non-Farm Payrolls (51K) and Unemployment Rate (9.1%) data, as well as the tentatively scheduled BOJ Rate Decision (<0.10%) and Press Conference, UK PPI Input (1.4%), and the Canadian Employment Change (19.6K) and Unemployment Rate (7.3%). Resistance: 1.3362, 1.3384, 1.3494, 1.3566, 1.3586, 1.3689, 1.3720, 1.3743, 1.3796, 1.3936, 1.3972, 1.4103, 1.4147, 1.4258, 1.4279, 1.4327 and 1.4499/1.4503. Support: 1.3333, 1.3244, 1.3055, 1.3000, 1.2968, 1.2873, 1.2733, 1.2643 and 1.2586. 200-day MA: 1.4054 and slowly rising. 14-day RSI: 30.4 and falling. Resistance: 77.19, 77.30/37, 77.71, 77.85, 78.02, 78.66, 79.05, 79.40, 80.00, 80.22, 80.82, 81.34, 81.76, 82.01/22, 82.77, 83.09 and 83.77. Support: 77.01, 76.88/96, 76.69, 76.56, 76.32, 76.25, 76.14, 76.10, 75.94, 75.00 and 70.00. 200-day MA: 80.43 and falling. 14-day RSI: 53.0 and rising. Resistance: 1.5632, 1.5664, 1.5685, 1.5705, 1.5714, 1.5745, 1.5839, 1.5867, 1.5883, 1.5912/19, 1.5951, 1.6000, 1.6037, 1.6081, 1.6130, 1.6204/06 and 1.6252/59. Support: 1.5531, 1.5483, 1.5422, 1.5373, 1.5343/55, 1.5326, 1.5293, 1.5123, 1.5000, 1.4947, 1.4872, 1.4785/97, 1.4500, 1.4474, 1.4345 and 1.4229. 200-day MA: 1.6128 and rising mildly. 14-day RSI: 37.4 and rising. Resistance: 0.9180, 0.9294, 0.9300, 0.9327, 0.9339, 0.9368, 0.9774/83, 0.9971, 0.9997, 1.0000 and 1.0065. Support: 0.9000, 0.8994, 0.8979, 0.8916/26, 0.8883, 0.8873, 0.8797, 0.8788, 0.8728, 0.8646, 0.8622, 0.8536, 0.8239 and 0.8000. 200-day MA: 0.8790 and falling mildly. 14-day RSI: 69.7 and flat. Resistance: 0.9700/04, 0.9731, 0.9803, 0.9842/64, 1.0000, 1.0077, 1.0146, 1.0176, 1.0296, 1.0310, 1.0347, 1.0360, 1.0373/96, 1.0473, 1.0481, and 1.0511. Support: 0.9689, 0.9667, 0.9651, 0.9620, 0.9536/41, 0.9500, 0.9462, 0.9330, 0.9220, 0.9077, 0.9000, 0.8870, 0.8858, 0.8632, 0.8550 and 0.8066/81. 200-day MA: 1.0387 and falling mildly. 14-day RSI: 29.2 oversold and falling. Resistance: 1.0490, 1.0500, 1.0506, 1.0646, 1.0669, 1.0742, 1.0756, 1.0785, 1.0853, 1.0868, 1.1000, and 1.1101/23. Support: 1.0372/84, 1.0347/56, 1.0322, 1.0360, 1.0255, 1.0236, 1.0208, 1.0139, 1.0088, 1.0057, and 0.9939/1.0030. 200-day MA: 0.9784 and rising mildly. 14-day RSI: 74.6 overbought and rising. Resistance: 0.7635, 0.7654/65, 0.7716, 0.7750/54, .07816, 0.7851, 0.7892, 0.7950/62, 0.8000/44 and 0.8060/93. Support: 0.7605, 0.7549, 0.7523, 0.7504, 0.7500, 0.7453, 0.7426, 0.7404, 0.7342, 0.7321, 0.7189, 0.7115, 0.7000 and 0.6945/62. 200-day MA: 0.7956 and rising. 14-day RSI: 27.4 oversold and falling. The latest Commitments of Traders (COT) report, released on Friday by the Commodity Futures Trading Commission (CFTC), showed that large futures speculators remained bullish in favor of the US dollar against the other major currencies as the trading environment continued to be risk averse. Non-commercial futures traders, usually hedge funds and large speculators, decreased their long positions in the Swiss franc, Japanese yen, Australian dollar and the New Zealand dollar directly against the US dollar while increasing bearish bets for the euro, British pound sterling, Canadian dollar and the Mexican peso, according to data reported on September 27th by the CFTC. EuroFX: Currency speculators decreased their futures positions for the euro against the U.S. dollar for a sixth consecutive week as sentiment continues to be bearish for the European common currency. Euro positions declined as of September 27th to a total of 82,473 net short contracts from the previous week’s total of 79,460 net short contracts reported on September 20th. Euro positions are at their lowest point since June 8, 2010 when net contracts were on the short side at -111,945. The COT report is published every Friday by the Commodity Futures Trading Commission (CFTC) and shows futures positions as of the previous Tuesday. It can be a useful tool for traders to gauge investor sentiment and to look for potential changes in the direction of a currency or commodity. Each currency contract is a quote for that currency directly against the U.S. dollar, where as a net short amount of contracts means that more speculators are betting that currency to fall against the dollar and net long position expect that currency to rise versus the dollar. The graphs overlay the forex spot closing price of each Tuesday when COT trader positions are reported for each corresponding spot currency pair. GBP: British pound sterling positions edged lower for the fifth consecutive week to stand at the lowest level since June 2010. Pound positions decreased to a total of 64,010 short positions on September 27th following a total of 59,755 short positions as of September 20th. JPY: The Japanese yen net contracts edged lower after gaining for two consecutive weeks, according to data on September 27th. Yen net long positions decreased to a total of 42,322 net long contracts reported on September 27th following a total of 45,617 net long contracts that were reported on September 20th. CHF: Swiss franc long positions declined for a fifth straight week as of September 27th. Speculators continued to trim bets for the Swiss currency futures to a total of 2,424 net long contracts following a total of 4,221 net long contracts as of September 20th. The Swiss currency, usually a popular safe haven currency, has remained in neutral since the Swiss National Bank conducted a policy to fight the strength of the franc and maintain a pegg against the euro at the 1.20 level. CAD: Canadian dollar positions fell further on the bearish side, according to data on September 27th. CAD net contracts fell to a total of 20,550 short contracts as of September 27th following an increase to a total of 5,458 net short contracts reported on September 20th. AUD: The Australian dollar long positions declined sharply for a third straight week as of September 27th as speculators have decreased their sentiment for the Aussie. AUD futures positions fell to a total net amount of 5,167 long contracts following a total of 23,095 net long contracts reported as of September 20th. The decline in speculators data marks the lowest level for Aussie positions since July of 2010. NZD: New Zealand dollar futures positions fell for a second consecutive week and declined to their lowest level since the middle of April, according to the data reported on September 27th. NZD contracts fell lower to a total of 9,591 net long contracts following a total of 13,565 net long contracts registered on September 20th. MXN: Mexican peso contracts continued their decline lower and dropped for the eighth straight week to remain on a bearish front against the dollar. Peso positions declined to a total of 20,626 net short speculative positions as of September 27th following a total of 16,890 short contracts that were reported as of September 20th. Are You Missing Out On Bargain Stocks? And so goes the current pop song. Funnily enough, those lyrics were written while the American economy was enjoying its credit boom six years ago. The US Federal Reserve Bank is doing its best to destroy the value of America’s dollar. What are other countries doing to protect their currency reserves? Last year, media outlets like The Age, Reuters, and Financial Times reported the big gold purchases from China and India. But they aren’t the only countries on a gold-buying spree. Many ‘emerging market’ countries are stocking up on their gold reserves. Russia’s bought more than 118,000 ounces this year, bringing its total gold reserves to 27.61 million ounces. Russia’s gold reserves are now worth USD$43.7 billion. Just under half the value of what Russia has in US Treasury bond holdings. Venezuela, a country with gross domestic product (GDP) of USD$340 billion, has increased its gold holdings by 10 tonnes over the past two years. It now has a healthy USD$16.9 billion worth of gold stashed away. The Wall Street Journal reports that,‘…emerging-market central banks are moving into the gold market as buyers because of a lack of options available to diversify their reserves…’The big education we got from the economic crisis is that you have to diversify. And now that we are in exceptional times, [a lot of] countries… don’t have that many choices,’ said market analyst Eija Salavirta of the Bank of Finland. But it’s not a case of countries diversifying. Have a look at this. Belarus’s gold reserves are 42% of its total ‘currency’ reserves. Up from 16% two years ago. Cyprus has grown its gold stash to 54%, 10% higher than 2009. And tiny Venezuela’s stock pile of the shiny stuff is 62% of its total currency reserves. So, the media has made a fuss over China’s big 400 tonne purchase of gold. But it only bumped up its gold reserves a trivial 1.57%. And India? Its gold pile is 8.37% of its total currency reserves. Emerging markets aren’t just increasing their exposure to other assets. They’re preparing themselves for a return to sound monetary policies. Greg Canavan, editor of Sound Money Sound Investments shared his thoughts on the Federal Reserve Bank’s influence over the price of money. ‘Taking the ability to create and set the price of money out of their hands would be a giant step forward in improving the economic system,’ he says. The problem is we can’t just return to a gold standard. Tying one currency to the value of a precious metal isn’t the answer. We need a new, modern gold standard. A sound monetary policy isn’t something that will happen overnight. Enabling central bankers to determine a currency’s worth has to end. The power to value or devalue a currency belongs to market forces. ‘National banknotes should promise to pay the bearer in gold. This way citizens have a recognised alternative to paper currency if they don’t like the way government [or] central banks [are] acting. Instead of being at the whim of central bankers, countries like Belarus and Venezuela are getting ready for the beginning of a sound global currency system. P.S. – If other countries are seeing the warning signs and preparing for a change in monetary policy, maybe you should too. For the past two years, Greg Canavan has used what he calls ‘old-school fundamental analysis’ to identify sound-investment opportunities in today’s market. He looks for solid businesses that offer good value. And uses them to help his readers build investment portfolios that protect and grow their wealth.. Click here to find out more. History has shown that buying stocks in times of fear and panic can yield good long-term results. But today’s environment is a lot different to the one we were investing in five years ago. It’s a lot more volatile. A lot more macro driven. We’re in a post-credit-bubble-bust world – not a bull market. And you can’t just pick stocks out of a hat hoping they’ll go up. And keep a weather eye on the wider economic story. A traditional value investor will tell you to focus on the fundamentals – cash flow, return on equity, assets and liabilities – and that news flow is meaningless noise. I’ve been telling my readers since 2010 to hold cash so we can take advantage when value opportunities present themselves. And as this market falls, opportunities are presenting themselves. That’s why cash is great to hold in an overvalued market. It puts you in a position to take advantage of good prices when they come. The further the market falls, the less useful cash becomes. Because the potential return from investing in quality businesses with strong returns on capital starts to outweigh the benefits of cash. Some companies look cheap right now based on their profit expectations for 2012. But those figures will be revised. And this market will continue to be tough. There will be plenty of people who never saw any sort of slowdown coming that will tell you, ‘Now is the time to buy’ and ‘Stocks are set to soar’. But the reality is we are in a bear market. Your aim should be to buy opportunistically. Do not chase the rallies. Only invest in stocks trading at a discount to value that value a margin of safety. Take advantage of the market’s emotions but don’t let it take advantage of yours. Greg Canavan is the editor of Sound Money, Sound Investments, a financial report devoted to unearthing great value investments amid today’s “money illusion” of fiat currency. To learn more go here. 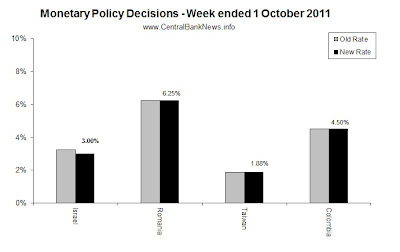 The past week in monetary policy was relatively quiet with just 4 central banks announcing interest rate decisions. Israel cut its rate by 25bps to 3.00%, while Romania held at 6.25%, Taiwan held at 1.875%, and Colombia held at 4.50%. Also making news in central banking and monetary policy was the announcement from the central bank of Angola, where it said it would launch a new benchmark interest rate. Elsewhere, Vietnam announced deposit interest rate caps, and Denmark announced a set of emergency bank liquidity provisioning measures. Looking at the central bank calendar, next week there are eight central banks scheduled to announce monetary policy decisions. The big one will be the ECB, with some speculation on a rate cut – but the more likely outcome being further liquidity measures, also, this will be Jean-Claude Trichet’s last meeting before Mario Draghi takes over as ECB president. Attention will also be paid as to whether the Bank of England or Bank of Japan announce further quantitative easing. The Central Bank of Colombia’s last move was an increase of the interest rate by 25 basis points to 4.50% at its July monetary policy meeting this year, following a 25bp increase in June. Colombia reported annual inflation of 3.27% in August, 3.42% in July, 3.23% in June, 3.02% in May, and 2.84% in April; which compares to the Bank’s inflation target of 3%. Goldman Sachs had previously forecast 2011 GDP growth at 5.5%, while Morgan Stanley had forecast just 4.9% growth for the Colombian economy. Colombia reported annual GDP growth of 4.8% in the June quarter and 5.1% in the March quarter, while the bank said the 2011 full year forecast of 4.5% – 6.5% is highly probable. The Colombian peso (COP) last traded around 1,918 against the US dollar, placing the COP virtually flat compared to the start of the year. The Vietnamese central bank last raised the required reserve ratios on foreign currency by 100 basis points in June this year and lifted dollar reserve ratios 100 basis points in August. The bank also increased its reverse repurchase interest rate by 100 basis points to 15.00% in May this year, and subsequently reduced the OMO rate by 100 basis points to 14.00%. Vietnam reported annual inflation of 22.42% in September, compared to 23.02% in August, 22.16% in July, 20.82% in June, 19.78% in May, and 17.51% in April this year, according to the General Statistics Office. The Vietnamese Dong is currently trading around 20,830 against the US dollar. Denmark’s central bank last raised the lending rate by 25 basis points to 1.55% in July this year, after increasing the rate by 25 basis points in April this year, mirroring the interest rate increases by the European Central Bank (ECB). The Danish Central Bank typically follows the moves of the ECB in order to keep its currency, the Krone, stable. Denmark reported an annual inflation rate of 2.6% in August and 2.9% in July, compared to 3.1% in May, and 2.9% in April this year. The Danish economy grew at a year on year rate of 2% in Q2, compared to 1.7% in Q1 2011 (2.9% in Q4 2010). The Danish krone (DKK) has strengthened about 3% against the US dollar this year, and last traded around 5.37. EU ministers have agreed to meet next week to discuss the possibility of a fresh stimulus package to help bolster weak economic figures coming from the European Union. EU finance ministers will focus on garnering support from the wealthiest euro-zone nations in order to bail out financially weaker nations, such as Ireland and Greece. At the request of both the IMF and the United States, the EU will backtrack on their previous 2009 plan to begin cutting deficits in 2011 as the economic crisis is causing an increase in calls for further stimulus aid. However, some euro zone countries, such as Italy, are somewhat skeptical of the commitment of the more fiscally sound countries to helping solve the economic crisis. Meanwhile, the idea that countries such as Germany and Sweden, who are not currently violating the EU’s deficit limit, could now afford to maintain bigger deficits and/or smaller surpluses did gain favor amongst members of the European Commission. The meeting is set for Tuesday in Luxembourg and, at the very least, will clear up some questions as to which direction the EU is heading.